A canoe is a lightweight narrow vessel, typically pointed at both ends and open on top, propelled by one or more seated or kneeling paddlers facing the direction of travel using a single-bladed paddle. 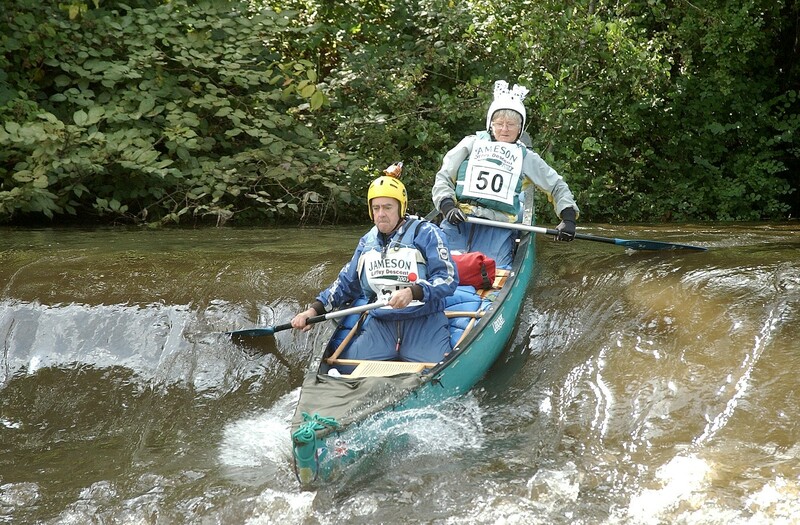 In International Canoe Federation nomenclature used in some European countries such as the United Kingdom the term canoe refers to kayaks, while canoes are called Canadian canoes. Canoes are professionally used for transport of people and materials all over the world. Besides canoes are widely used for pleasure racing, whitewater canoeing, touring and camping, freestyle, and general recreation. The intended use of the canoe dictates its hull shape and length and construction material. Historically, canoes were dugouts or made of bark on a wood frame, but construction materials evolved to canvas on a wood frame, then to aluminum. Most modern canoes are made of molded plastic or composites such as fiberglass. Until the mid-1800s the canoe was an important means of transport for exploration and trade, but then transitioned to recreational or sporting use. However, in some places, canoes are still used locally for their historical purpose. Canoeing has been part of the Olympics since 1936. In places where the canoe played a key role in history, such as the northern United States, Canada, and New Zealand, the canoe remains an important theme in popular culture. Canoes can be adapted to many purposes, for example with the addition of sails, outboard motors, and outriggers. Canoeing can be done all over Ireland. Many providers run ‘learn to canoe and kayak courses which is the minimum skill level needed to join most clubs in Ireland. Alternatively some clubs run their own learn to Canoe/Kayak courses too. To find out more, why not check out our map on our website to find out more about clubs that are close to you. You can do just that by clicking here. As with every sport, the equipment needed will vary depending on what level of skill you’re at so it’s always a good idea to have a chat with your club members or instructor about what gear would be best suited for you. Important weather conditions you need to be aware of while canoeing are wind speeds, wind direction, wave height/direction and tides.